AJB Sports in Education is proud to be working in a great number of schools across Worcestershire county and values the strong relationships between ourselves, the schools, the staff, and most importantly, the pupils. These ties have been fostered and grown over many years through delivering high quality PE lessons to pupils, and working closely with staff members to ensure a continually innovative and evolving curriculum is being delivered each term and throughout the school year. 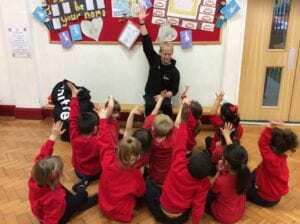 We are delighted to be able to run these PE lessons with children from reception, all the way up to year 6, ensuring that the best Physical Education programmes are being provided throughout these vital years of a child’s development. 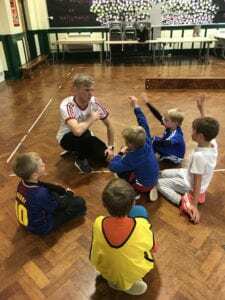 AJB Sports in Education provide high quality, experienced specialists to run our sessions for every school year (Reception – Year 6) during Term Time. We pride ourselves in delivering high quality, fun, creative and structured lessons covering the KS1 and KS2 National Curriculums. Our Qualified, Enthusiastic and DBS checked staff will provide cost effective and organised lessons for your school. There are many ways to teach and coach both in and out of the classroom with a variety of different styles being used in each situation; Autocratic, Democratic, Q and A, Observation and Feedback are just a few examples. However, at AJB Sports in Education the style that we primarily adopt within our lessons is one of Guided Discovery. This approach allows our staff members to create fun, interactive and challenging sessions that allow the children to problem solve their way to answers. Instead of giving students the answers, such as “Stop, stand still, you should have done it this way”, guided discovery is an approach that allows children to begin working out problems on their own but under the guidance of our staff. We encourage children to ‘Try – Make a mistake – Learn from the mistake – Try again’. – Allows children to discover the best way for them to complete a certain task or to develop a new skill. – Allows the students to experiment with different alternatives in order to achieve the desired goal. – It increases their understanding of why certain options are more advantageous and effective than others. – It is an ideal way for students to discover possible strategies that can be used within specific games or sports. The idea behind guided discovery is to ensure children understand not only the How, What and When but importantly the Why! Therefore when competing individually or away from a coach, they will have the necessary skills to be able to workout problems for themselves instead of relying on adults to tell them what to do. We love working with Reception PE – we see it as a blank canvas ready to learn! At AJB Sports in Education we believe our main role at Reception PE level is to create a fun, safe environment for children to enjoy and learn through entertaining and exciting games. We understand that not every child will like PE and enjoy playing sport so it is incredibly important to ensure all lessons are different and aimed at all levels of ability and interest. We want all children to leave our lessons having had a great time, regardless of ability. At this young age, PE can teach so much more than just how to play a sport or what the basic rules are. We try to ensure our lessons and games are developing not just the physical skills but their mental and social skills as well. We place children in fun and challenging situations where teamwork is needed, problem solving is required, communication and sharing are the answers and even some times maths will be necessary! PE can be an effective tool that can be utilised in many areas of a child’s development, for example the fine motor skills used for handwriting can be helped with Hand eye Coordination games and schemes of work. The children will learn so much that can be used both inside and outside of PE lessons for their future development as they play fun games like Sharks and Surfers, Cheeky Monkeys and Pirates! Please take look at a great testimonial from Reception Teacher Mrs Palfreyman from St Georges Catholic Primary School in Worcester to see how our philosophy and methods are being used to benefit children in the area. We are able to provide lessons that cover everything from the National Curriculum KS1; Balance, Coordination, Throwing, Catching etc. We believe that, again, our focus should be on learning through fun. Children at this age are beginning to develop their Fundamental Movement Skills that they will take into the specific sports played in future. Again we love to focus on developing all areas: Physical, Mental and Social skills within each session and scheme of work. 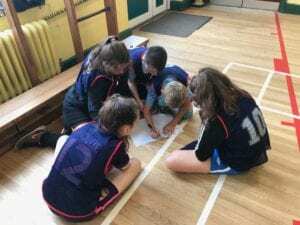 We highly value challenging the children and putting them into small groups to talk, problem solve and evaluate performances together in order to stretch them and develop those core problems solving skills. The Psychological and Social sides often get forgotten during PE lessons, yet the ability to communicate, problem solve, work as a team and learn to be a leader are corner stones of adult life – so why not teach and encourage this through sport? This is exactly what we try to do in all of our lessons – give some power and responsibility to the children. What we find is that instead of hearing “I cant do that” or “It’s too difficult”, we often hear “I’ve got an idea”, or “we could try this”. Placing children in fun game situations where they have to problem solve, either individually or together in teams, encourages creativity and teamwork. Sport is regularly organised chaos with moving parts and changing situations at all times, so it is never a case of ‘in this situation you must do this’. Often success is achieved through understanding the problems faced, and making the right choices. We try to encourage children to see option A, B, C, D and even E and then guide them to make the choice for themselves for how to find a solution. The thought process of children leads to some wonderful and imaginative ideas when given the chance to express themselves, and our part as educators comes in encouraging their creativity regardless of success, and teaching them that losing is just the first step of learning. Mrs Lindsay from Crowle First School sent us some lovely comments about the PE AJB Sports in Education deliver at her school. We’d love you to have a look. At Key Stage 2 our focus gears more towards both the development of their Fundamental Movement Skills and also their Sports Specific Skills. 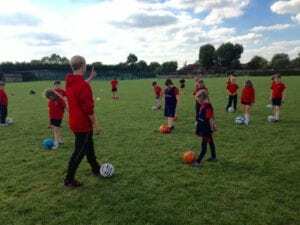 We focus on KS2 Sports National Curriculum topics including Specific sports like Football, Rugby and Hockey etc plus developing Strength, Technique and playing Invasion Games while learning the Principles of Attacking and Defending. 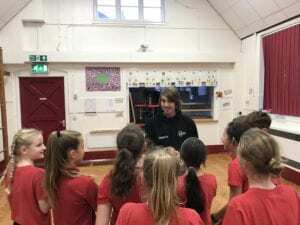 Even at Key Stage 2, we continue to promote an element of fun during lessons, as this is still incredibly important to how the children react and feel about sport and PE. However, our focus leans towards introducing Sports Specific skills and the introduction of tactics and sports specific teamwork. Children are shown that many skills are transferable across sports and how to use these skills to their benefit. At this age winning becomes more important to children, but we also encourage an ethos that sees losing an opportunity to learn and that it is just as valuable overall. Our Guided Discovery style allows children to learn to develop their own techniques within sports and be creative in both technique and decision making within games. For those interested in competitive sports, we design sessions to push them to the next level and to continue building upon their innate love of sport and high levels of ability. Whilst at the same time we work hard to light a fire under those children who have never held that same emotional connection to sports, and make sure they leave our lessons with a new found passion for the subject and may look to continue to play outside of school. In addition, AJB Sports in Education can tailor our services to the individual needs of your school and will work diligently with teachers and schools to ensure that children get the very highest level of coaching that they deserve and require throughout their growth. We are more than happy to work closely with the school’s current staff in order to share our experience and knowledge in these areas to provide teachers with valuable ideas, modes of working and session plans that can then be replicated in future.